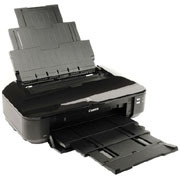 A3/A4 Printer for use with anycake.com's edible ink cartridges & icing sheets. If using edible inks in your printer you will require a new printer that has never used standard printing ink. You can NOT install edible ink cartridges in a printer that has already used standard printer ink as the edible ink will get contaminated. Thank you for your support. I've received the printed sheet and it was really,really good.